Today's conglomeration is a little bit of an overload on JoS. A. Banks. 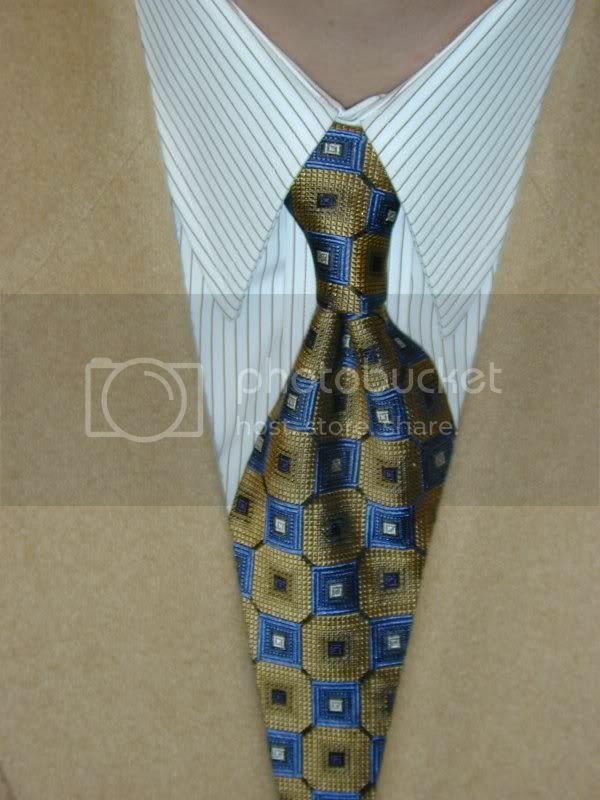 The sportcoat is a tan camel hair from them that I got on Ebay on the cheap. The necktie is from their Signature line. They're fairly expensive ($80 or so) if purchased new but I got this one on Ebay too. It's a geometric (obviously, from the picture) with a couple different shades of blue and brown. I wore some blue trousers that matched the blue in the tie pretty well, if I do say so myself. If I'm not careful I'll be conglomerating outfits. The shirt is another Paul Fredrick broadcloth straight collar with fine, brown stripes. Oh, and I used a four-in-hand knot once again today. A little about ties and Ebay -- it's a great way to pick up some nice neckwear for a fairly reasonable price. You'll probably be a few months (years) behind the current style but you'll save a ton of money. I like neckties a little too much so it gives me an opportunity to expand my collection more than I would by paying full price. Neckwear is the only real opportunity for men to add a little color to their conglomerations. Dress shirts are generally either white or blue. But wait, there's more. Now you can have a white dress shirt with blue stripes! Granted, I don't take full advantage of neckwear possibilities but I'll get there someday.